Costume Blog Writing Month, that is! I've been doing so much long-form writing lately that I thought it would be fun to loosen up a little. There is a semi-official list of prompts, so let me get the ones I've missed in here on the third day of the month. Hello! I'm sure you have a general idea of who I am if you're following my blog, but if you're not: I'm Cassidy. By trade, I'm a museum professional; by vocation, I'm a fashion historian. I don't tend to write much here about myself personally because I'm active on a bunch of social media platforms, though to be honest, I tend to write about fashion history there as well rather than anything personal. I suppose I just do it in a more personal way? You can find me on Twitter (@mimicofmodes), Tumblr (@mimic-of-modes), and Instagram (@mimicofmodes) - and I'm active at Ask Historians as a moderator and an answerer of fashion history questions. You can read a collection of my past answers here! I rarely post here about current projects, since I tend to save this space for full articles - Instagram is actually a great place to follow me if you're interested in updates and in-progress pics, particularly with projects that are hand-sewing-heavy. Right now, I'm sewing a 1950s bathing suit, pattern above. This is tricky on a few levels. For one, I don't typically sew with knits or elastic (you can't see it here, but the lining is swimsuit fabric and it has elastic around the leg holes). For another, the bust obviously needs to fit differently than it does in a dress, worn over a bra. For a third, I really have no idea how a bathing suit made of quilting cotton and fastening with a zipper is going to work in the water! 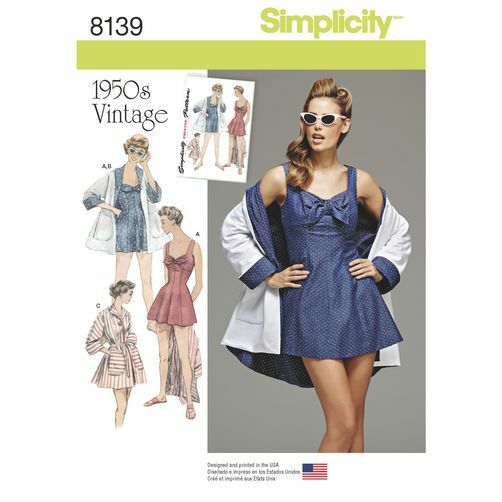 Following that, I intend to make another version of Butterick 6018 (I'm wearing the one I have now in the above photo) and this vintage slip. I rarely buy actual vintage patterns, but I managed to find one with a 40" bust, so I had to grab it! Normally when I look at extant garments, I concentrate on much older pieces, but given my current and near-future projects I'm examining pieces that are just vintage. While right now I will be making Butterick 6018 out of navy and white gingham, I would really like to use this scheme in the future. With my short waist, I think the Butterick pattern's underbust seam and shaped torso/skirt panels are more flattering to me than this fitted bodice and gathered or pleated skirt would be, and it does have that flaring collar. Making it in a good white cotton (Pimatex? batiste?) 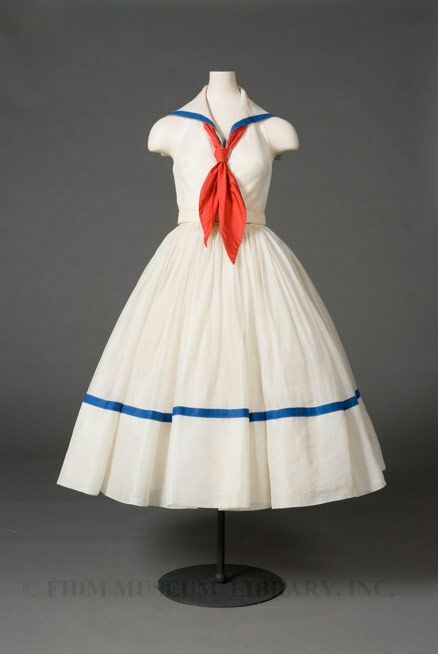 with some blue silk ribbon trim and a red scarf could result in a very cute summer dress, perfect for going on vacation to the seaside! Too bad I won't have the time to do it before I go to Cape Cod in September. Nice projects- I'd be concerned, too, about the quilting cotton swimdress...chlorine will trash the colour very quickly. I suppose if the zip is plastic it should be OK though. Maybe you should switch out the cotton to a lycra swimfabric? Fortunately, I mostly swim in the ocean! On the occasions when I swim, which is pretty rare. I expect it will lose some of the vibrancy of the color even from the salt water, but I kind of just want to see what it's like to wear a non-stretchy swimsuit. Probably like swimming in my clothes. These projects will turn out great! I am so with you on sewing with knits. Have you considered tropical wool for the swimsuit? It's not stretchy and was used for bathing costumes in the past, too. I have not! That would probably be a good choice for next time. :) Please write about it if you do! I have heard from other costumers that they have tried it but did not see many posts about wool swimsuits. It would be very interesting to read about experiences. I had a wool swimsuit when I was 12-13. It was navy, with princess seams, a one piece naturally. And so flattering because it was the loveliest shade of rich marine blue. Somehow it held up in the chlorine pool (and baby in southeast Texas back then those pools were so chlorinated it turned your eyes red in five minutes! As I remember there was no zipper, just a stretch fabric. With shaped foam bra cups that turned to crunchy sand after a few months and were a fashion disaster to a flat chested girl who lay down on cement to get a tan on her back. Loved that suit tho -- the wool knit gave me a real grown up feeling.